Oh look! 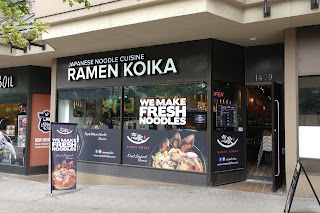 Another Ramen joint on Robson Street! Yes, I guess there is never enough of a good thing when it comes to Japanese Ramen in Vancouver. Seemingly, it doesn't matter how many there are in a small area, there will always be the clientele. 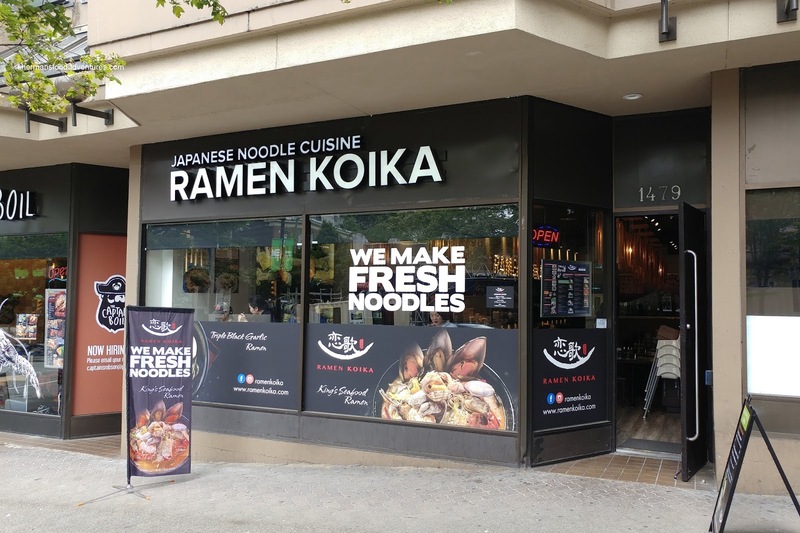 To be fair, Ramen Koika only replaces the short-lived Hapa Ramen in the adjacent spot where Hapa Izakaya used to reside. I've tried their original Davie location and have enjoyed their offerings. 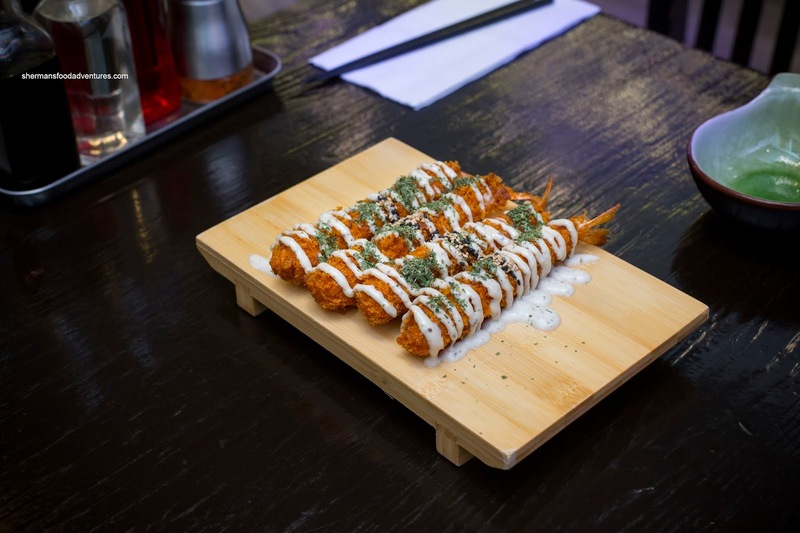 Recently, I was invited to check out their new location to sample some of their specialties in addition to an interesting new creation. Before that, we got down to some appies including the Puri Puri Ebi and Spicy Chicken Karaage. 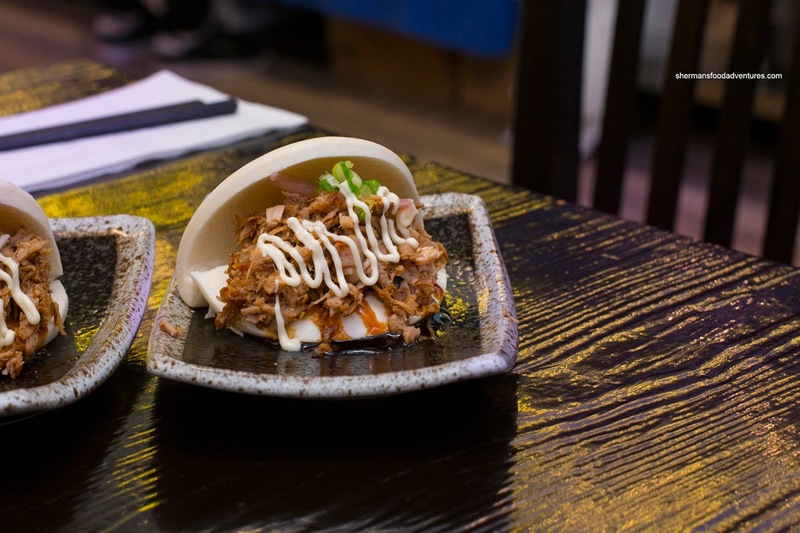 These two are some of the more popular items on the menu and we could see why. Crunchy with a thick breading, the ebi actually ate a lot lighter than it appeared. The ebi itself was buttery and moist with a light snap. Despite the copious amounts of tartar on top, it did not make things too creamy nor greasy. 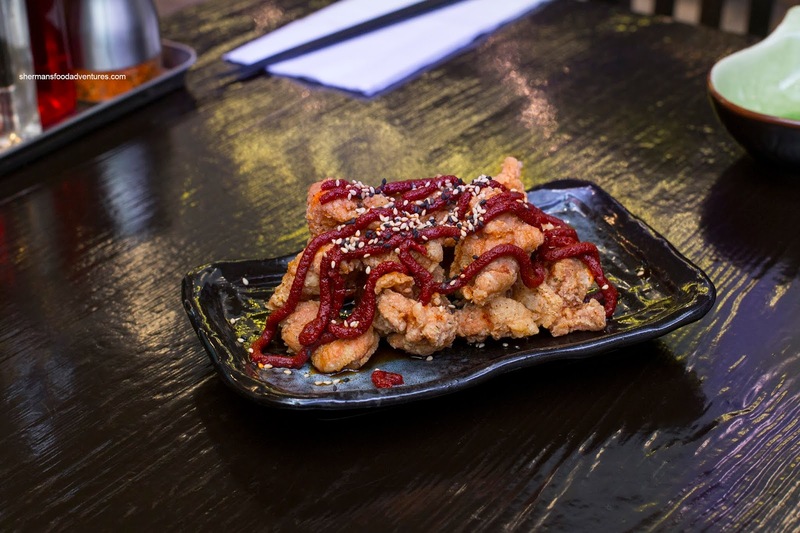 At first, the spicy karaage looked like they just squeezed some spicy paste on top of a regular order. Oh wait, they did do that! But appearances aside, this was super yummy. Although there was good kick from the sauce, there was still layers of flavour. The chicken itself was tender and moist with a lightly crispy exterior. Continuing with more appies, we tried their Housemade Ebi Gyoza and Pork Bao. One bite and I could really appreciate the freshly-made gyozas. 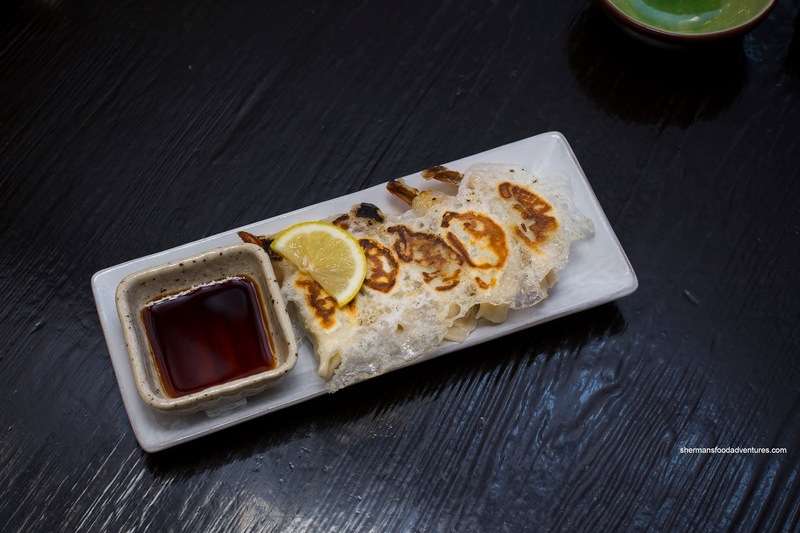 The dumpling skin was medium-thick and delicate. There was a certain tender texture that was also supported by an elasticity. Moist and balanced, the filling was mildly-seasoned and tender. As with the puri puri ebi, the shrimp in the gyoza was meaty and had a buttery snap. I only wished that the bottom was more crispy. 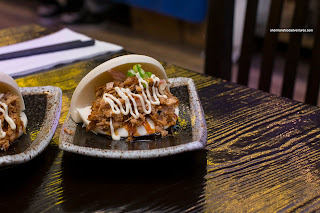 We finished with 2 Pork Bao featuring shredded pork, marinated onion, green onion, sauce and mayo in a Chinese bao. We requested for less mayo so we could see the pork, however, their default amount of mayo is the perfect amount (since we were wanting more of it as we ate the bao). I found the pork to be tender and moist while the saltiness to be just enough. The bao itself was soft and fluffy. 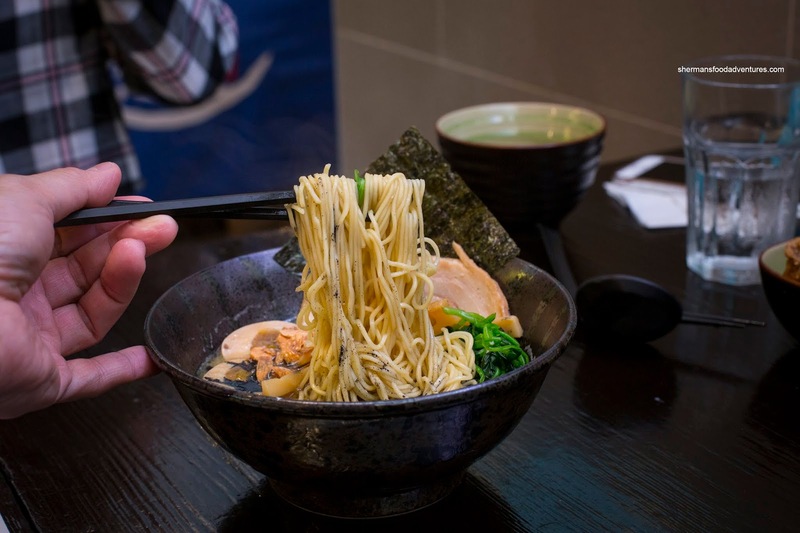 We moved onto 2 of their classic offerings in the Triple Black Garlic Ramen and King's Seafood Ramen. The thin noodles in the garlic ramen were completely on point being firm and chewy while cooked through. Each noodle pull (no not for the picture, but to eat) was subjected to the silky and aromatic nuttiness of the black garlic oil. There was no mistaking its presence and influence on the already meaty broth. I found the chashu to be evenly fatty and subsequently buttery tender. Most impressively plated (or bowled? 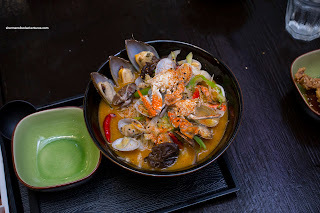 ), the seafood ramen sported green mussels, clams, blue crab, veggies, Thai chili and red pepper powder. Considering how expensive ramen costs in Vancouver, this was only $15.95 (which we considered as a fair price especially on Robson). We asked for medium spice and it was noticeable without being overwhelming. The broth was sweet and briny. Seafood was on point as with the noodles. 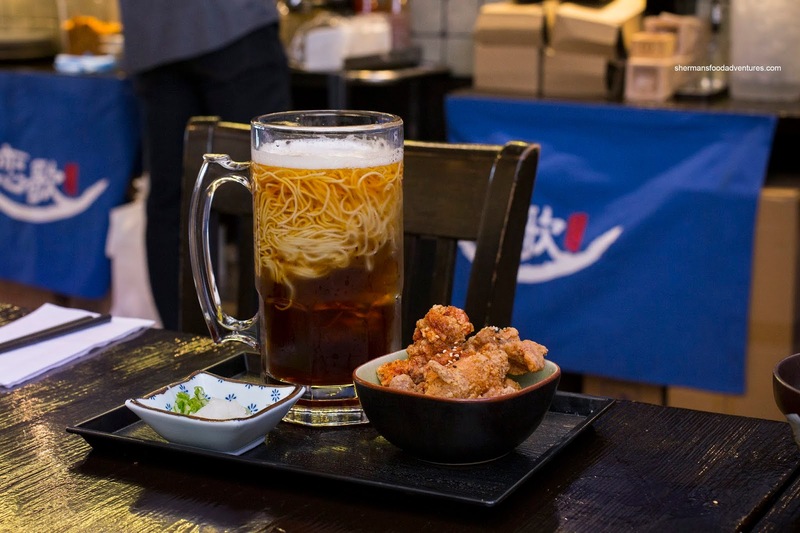 Saving the best for last, we tried the new their new creation - Beer Soba with a side of regular chicken karaage. Okay, I know what you are thinking - this looks strange and seriously beer? Don't worry, it is actually a cold dashi with house made noodles. The only beer is the froth on top. Hence, it ate like a zaru soba with firmly chewy noodles and a rich and slightly sweet dashi. I didn't think I would like this, but it turned out to be really good. Great dish for a hot day. So as you can see, there is some creativeness with the food here. For me, I thought they are able to incorporate their unique touches successfully. You really can't go wrong with the 2 bowls of ramen we tried (as they are the best on the menu) as well as their new beer soba.